Meet at 10:30am at the Sunnyvale Caltrain Station on Saturday October 6, 2018. You can rent a bike from Sports Basement just a short 15 minute bike ride from the Station. The 8:07am train from San Francisco arrives in Sunnyvale at 9:34am -- enough time to Uber/Lyft to Sports Basement, pick up a bike and ride back to the Caltrain station. Others who come by train with their bike can check out Sunnyvale's Farmers Market on Murphy Street until the start time or just hang out and chat. There is plenty of free parking nearby or you can park at Sunnyvale's Sports Basement (1177 Kern Ave, Sunnyvale, CA 94085) if you are renting a bike. Featured Silicon Valley landmarks: Sunnyvale Murphy Street & Farmers Market, Stevens Creek Trail, Googleplex, Microsoft, LinkedIn, Intel, Yahoo, Nvidia, Intuit, Mountain View Shoreline Park, Don Edwards National Wildlife Refuge, Bay Trail, Southern end of the San Francisco Bay, Moffett Airfield & Hangers, Levi Stadium, San Tomas Aquino Creek Trail. We will stop for lunch around noon at Shoreline Lake American Bistro and at Pinkberry for frozen yogurt just before returning to the Caltrain Station. The ride is a flat leisurely 26 miles with about 75% of it on trails away from cars. 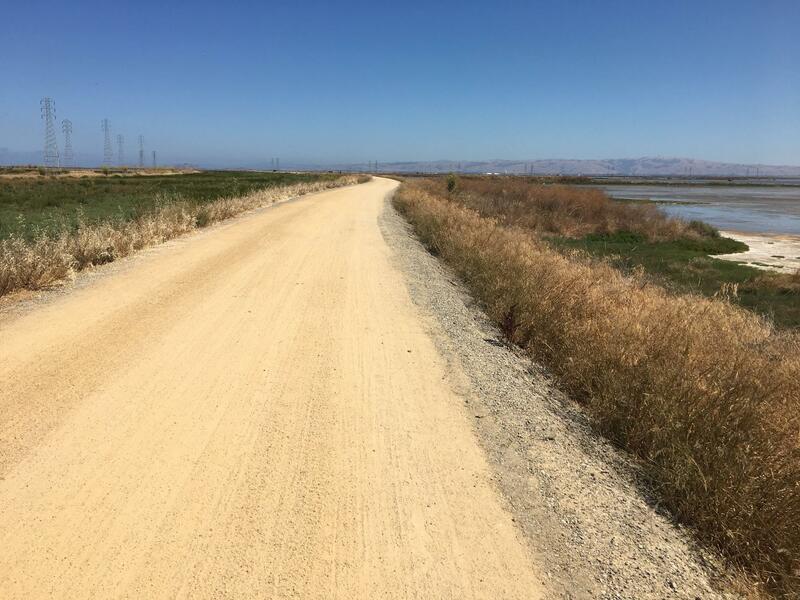 There are some short sections of dirt road that are rideable with skinny tires but more comfortable on fat tires. This is a social/sightseeing ride, NOT a training/exercise ride. We will return to the Caltrain station in time to catch the 4:23pm train back to San Francisco or if you skip the frozen yogurt you can catch the 2:53pm train. Ride will be cancelled if it is raining or there is more than a 50% chance of rain between 10am and 5pm that day. Email tim@oey.us for last minute updates. IMPORTANT: Each participant must own/rent/obtain a bicycle and helmet. If you are renting, make sure to reserve your rental bike in advance at https://shop.sportsbasement.com/search?query=Bike+Rentals. Bike rentals from Sports Basement are typically $32-100 per day depending on your desired bike.